Linda: Thanks for joining me today. It’s nice to have you back again. 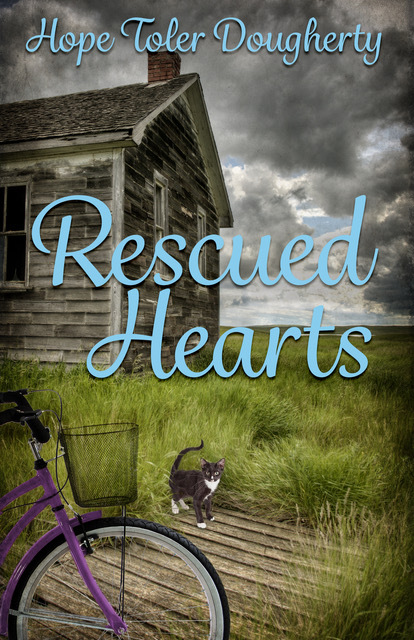 I love the cover for Rescued Hearts, your romantic suspense novel. Is there a real building that gave you inspiration for the plot? Did you have any input about the cover photo? Hope: Thanks so much, Linda. The talented Diane Cretsinger Turpin created that cover for me, and yes, it’s a real house on my road. I thought it looked like the perfect abandoned house in the story. I took a picture and sent it to Diane to show her what I was thinking. She took it from there. I had some input with the font and changed the bike from red to purple to match the one in the story. LM: The age old question for writers – are you a planner or a “pantster,” and what is your favorite part of the writing process? Hope: I’m mostly a “pantster.” Since I write love stories, I have the normal main story arc of girl meets boy; attraction occurs; conflict happens; conflict is resolved, and they live happily ever after. I may have a few scenes that I know will happen, but I don’t plan the whole outline. Sometimes writing the story is like reading it because I don’t know exactly what’s going to happen in the next scene. That’s when I pray really hard! I love writing dialog. I like writing the first draft when it’s going fast and smooth. I really like editing, though, when I tinker with a sentence until it’s close to perfect. I’m such a nerd. I love looking for the exact word that fits a situation. LM: How did you get started as a writer, and how did you decide to seek publication? Hope: As an old English major/English teacher, I always wanted to write a book, but the reality of doing it was daunting. I couldn’t figure it out, so I wrote sporadically for local newspapers and magazines—never enough to make a living at it, but enough to keep my clippings file current. When our oldest daughter was weeks away from high school graduation, I knew my life was beginning to change. Her siblings would follow right behind her, and my cushy but demanding gig as a domestic engineer would be over. I wanted to focus on my freelance writing and decided to write a piece for Guideposts Magazine. As soon as I wrote what I thought would be the topic, I began daydreaming about Ireland. That daydream became one of the early scenes in my first novel, Irish Encounter. It took quite a while, however, before I admitted I was writing a book. I called it a writing project even as it grew to 60,000 words and beyond! 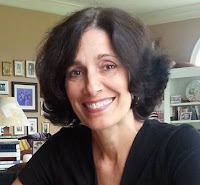 My husband pushed me to “do something with it,” so I went to my first writing conference, Blue Ridge Mountains Christian Writers Conference and started meeting other writers, editors, and agents. LM: I love the story on your blog about your rose garden. I’ve had terrible luck with growing most flowers, especially roses. How do you juggle your gardening with your writing? Hope: I’m so flattered that you think I juggle writing and gardening! Ha! Unfortunately, I always have too many weeds. 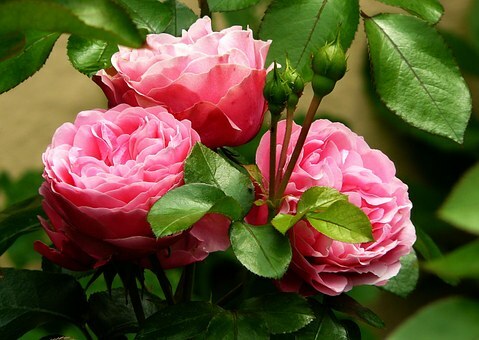 This is the first year of the rose garden, and we wanted it to get established well. We had some help with the planting and spraying. I love seeing those plants when I drive down our driveway. I love cutting the roses and bringing in bouquets. Spending a half hour in the garden is a nice break from writing and a good way to loosen any blocks in the creative process! Favorite vacation place: We’ve spent several vacations in Ireland. In fact, Irish Encounter is partially set in Galway, my favorite city. My passport is up to date, and I could go back any time. We also love Deer Valley, a YMCA family camp in central Pennsylvania. My husband went there as a child, worked as a counselor for a few years, and our family loves every minute we get to spend there. Hope: My agent, Jim Hart, is looking for a publishing home for my fourth manuscript. I’m taking notes for my fifth. I know the characters and the meet cute. I’m still trying to figure out a few more things before I actually begin writing. Thank you for having me on your blog. You asked some fun questions, Linda! LM: You're welcome! I hope you'll come back to visit again! Children's clothing designer Mary Wade Kimball's soft spot for animals leads to a hostage situation when she spots a briar-entangled kitten in front of an abandoned house. Beaten, bound, and gagged by the two thugs inside, Mary Wade loses hope for escape when a third villain returns with supplies. Discovering the kidnapped woman ratchets the complications for undercover agent Brett Davis. Weighing the difference of ruining his three months' investigation against the woman's safety, Brett forsakes his mission and helps her escape, the bent-on-revenge brutes following behind. When Mary Wades' safety is threatened once more, Brett rescues her again. This time, her personal safety isn't the only thing in jeopardy. Her heart is endangered as well.